JCB is set to bring new levels of innovation and safety to the site dumper market with the unveiling of a new concept seven tonne Hi-Viz model as the company announces plans to manufacture its own range of the popular product. The new Hi-Viz concept machine addresses growing industry concerns over accidents and serious injuries involving site dumpers on construction sites. JCB’s new 7-tonne concept machine is designed and engineered specifically to tackle those concerns by enhancing visibility, operator protection, stability, comfort and serviceability. The machine will go into production at JCB’s World Headquarters in Rocester, Staffordshire at the end of 2017 in a move that will create more than 50 new jobs. It will be manufactured alongside nine other site dumper models for the one to nine tonne market. The biggest market for the machines is the UK and Ireland followed by France. JCB CEO Graeme Macdonald said: “JCB has offered a range of site dumpers under a supply agreement with a third party manufacturer since 2015. In deciding to begin manufacturing our own range, we have taken the opportunity to innovate and we have developed a solution that directly addresses safety concerns. This is good news for everyone in the industry and it’s good news for manufacturing in the UK and Staffordshire. 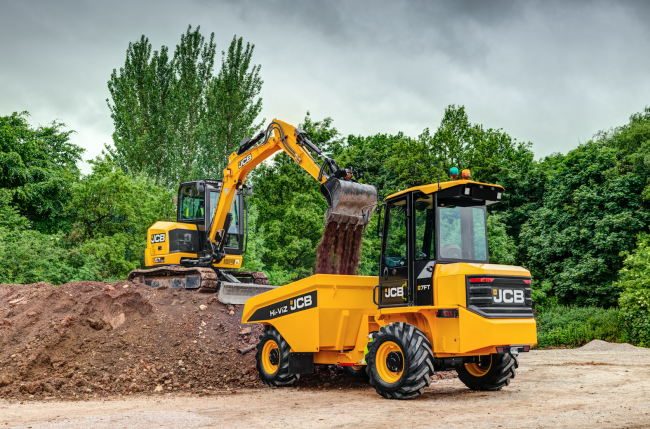 JCB will build both forward tip and swivel tip versions of the Hi-Viz site dumper when it goes into production at Rochester at the end of the year.